The Odyssea is a wet submarine, meaning that the two occupants are not in a sealed environment and must wear full scuba gear. The Odyssea submersible is powered by a thrust vectored electric motor which can propell the vehicle at up to 5 knots. Depth control is via a variable buoyancy system which allows the sub to be used for a variety of underwater tasks, such as transporting equipment, as a camera platform, for exploration, or just for leisure. The batteries of the Odyssea offer up to 3 hours of dive time and require 8 hours to charge. 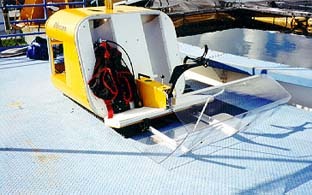 The sub has been designed to be simple to operate and maintain with low running costs. Due to its relativley small size and weight the Odyssea can be easily transported on most boats and will fit in the bed of a regular pickup.